Lay out a large piece of clingfilm, and add the bacon rashers in overlapping layers on top. Flatten the chicken breasts with a rolling pin between a sheet of baking paper. Then add them on top of the bacon, and top with the small broccoli pieces. 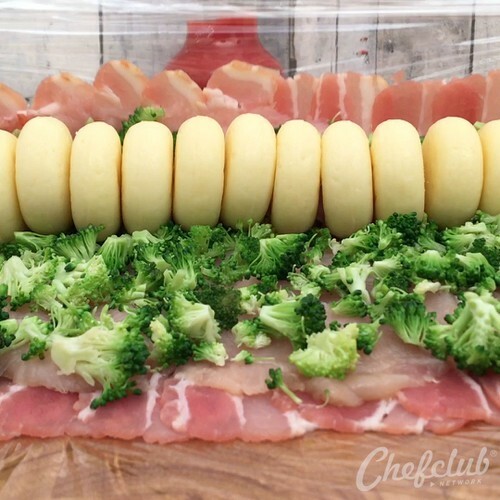 Add the Babybel cheeses to the middle, and roll the whole thing up tightly around them to make a sausage shape. Bake in the oven for 1 hour at 170°C. Serve in slices with tomato sauce on the side.